Princess Gwladys was the eldest - and best attested - daughter of the saintly Irish immigrant, King Brychan of Brycheiniog (Wales). With her countless brothers and sisters, she was raised at the Royal & Christian Court at Garthmadrun (Talgarth), where she grew into a beautiful young woman. Before long she came to the notice of some of the most eligible bachelors around, particularly Brycheiniog's menacing neighbour, King Gwynllyw Farfog (the Bearded) of Gwynllwg. Gwynllyw sent envoys to King Brychan requesting the hand of his daughter in marriage, but the holy man sent them away. Gwynllyw was a rough pagan warrior king, quite unsuitable for his delicate offspring. The King of Gwynllwg, however, was not so easily put off and decided he would take his prize by force. With three hundred men to help him, he made a daring raid on Brycheiniog and made off with Princess Gwladys. Brychan pursued him as far as Fochriw where the two were accosted by their High-King, Arthur. Struck by the lady's beauty, Arthur was, at first, tempted to take her for himself; but his fellows persuaded him to support Gwynllyw's cause and Brychan was eventually brought round. Gwladys reigned with her husband as a pious and wise monarch, tempering his, often rash, behaviour. They became the parents of SS. Cadog, Eigion, Cyfyw, Maches & Glywys. 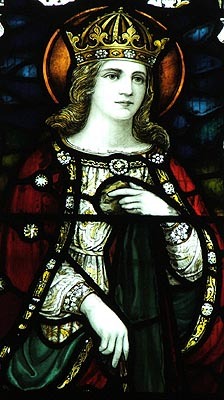 Cadog - if not all the children - was raised as a Christian by St. Tathyw at Caerwent, probably at his mother's insistence, and later converted his father to Christianity. In her last years, Queen Gwladys lived apart from her husband as a hermit in Pencarnau and, latterly, at the Capel Wladus in Gelligaer. Here, she was buried and a Celtic cross slab found there is thought to be her memorial. It can now be seen in Gelligaer parish church. Since her death, she has been revered as a Saint. Her feast day is the same as her husband, 29th March.